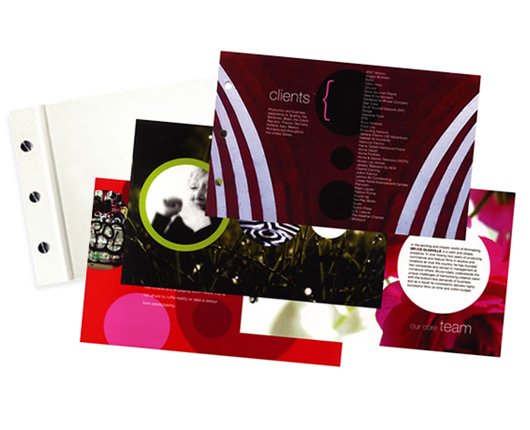 Tantrum Pictures, a television and film production company, needed help developing a promotional piece to be used as an introduction to their company and services beyond their DVD reel. They also wanted the ability to update or rearrange information as needed for a specific presentation. We designed a custom hardcover book that would hold a DVD of their film work (attached to the inside back cover on a disc nub) and include colorful printed pages to showcase their photography. Each book was bound with three metal screw posts that had a finished look and allowed the client to easily add or remove pages.